Thank you to those of you who donated and participated in the 25th Anniversary Gala in November, 2018 at the LeMont Restaurant. It was a wonderful event, and we look forward to our next Gala during the 2019-2020 season. More information will be posted soon! Volunteer your time to help make the Gala a success! Would you like to wish the orchestra well, offer encouragement for the upcoming season, or offer a thank you to someone special? 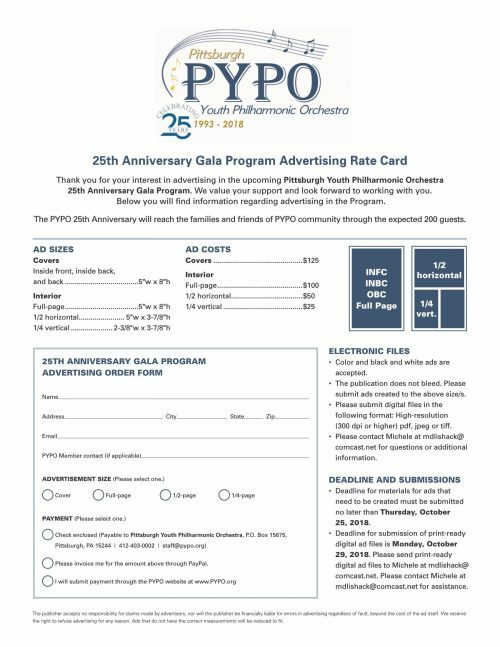 Consider advertising in our Gala Program. For more information, the rate card is linked below.